CMT is giving away a country music fan's DREAM vacation to LAS VEGAS where the winner will not only get to see the Reba and Brooks & Dunn concert, they'll also get to meet the stars! 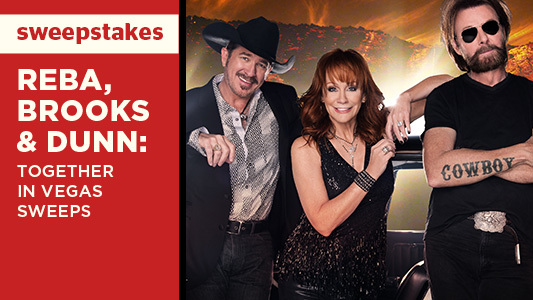 Grand Prize: Two (2) Tickets to REBA, BROOKS & DUNN: Together in Vegas (subject to availability July 12 - 30, 2016). Two (2) night hotel accommodations in the Julius tower at Caesars Palace(subject to availability July 12 - 30, 2016). Meet and greet opportunity with Reba, Brooks & Dunn. Two (2) Round trip coach airfare tickets (up to $1000 airfare). This Sweepstakes ends on 06/10/16 and you can ENTER DAILY to win.